What is the CNC Milling Machine? CNC (Computer Numerical Control) converts design from CAD (Computer Aided Design) software into numerical data becoming coordinates in a 3D graph which controls the CNC 3D cutter with precision and accuracy to hundredths of an inch. The stone is cut and turned on 5 interpolated axes including the traditional X,Y, and Z axes. This is controlled from a touch-screen color monitor and joy-stick. CNC is capable of performing many complex milling operations, including cutting bulk stone, shaping complex forms, routing recesses, lathing columns and pillars, and contouring materials. Our stone fabricator, along with our CNC machines, creates custom-fit stones. A stone fabricator helps you choose the right stone for your home improvement project. The practical design, includes templating, or measuring, at your home. The dimensions of the installation are all unique to each setting. Based on your kitchen or bathroom’s measurements, we know exactly how much stone is needed. Once this is done, the type of stone, veins, shading, and color can be considered based upon the available stone company supplies. Once you select your stone, we will send it to our CNC Room. We have state of the art CNC machines that are used by trained craftsmen to custom-cut your stone with perfect cuts and edges. 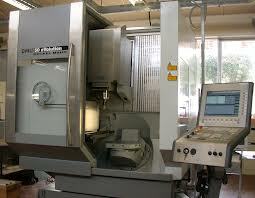 Our CNC Machines occupy over 7000 square feet in our facility and are capable of doing up to 3 kitchens at a time. 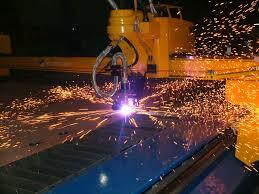 We offer a turnkey solution with quick service and high quality. At Alpha Stone we DO NOT supply pre-fabricated products. What is the state-of-the-art Faro Arm that Alpha Stone uses? 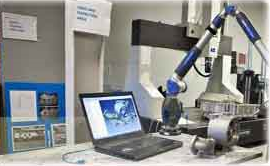 A Faro Arm is a CMM (Coordinate Measurement Machine) used to measure, image, and actualize building materials in 3 dimensions. This technological advancement enables us to measure images and compare composite structures to create high precision and high accuracy digital templates.